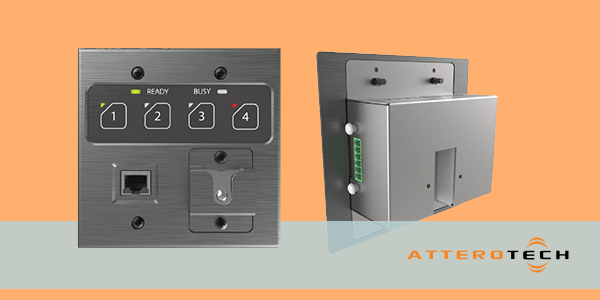 The Zip4 from Atterotech is a 4-button IP Paging interface that addresses the unique communications needs of large sporting venues, airport terminals, train stations, conventions centers, and corporate facilities. Paging Audio Interface – IP audio can be routed over a Dante™ or AES67 network from the Zip4 to a DSP or other Paging Management System (PMS) controller to distribute paging audio. Rugged Design – The faceplate is constructed of solid brushed aluminum and a front panel RJ-45 jack serves as the PTT microphone input with a panel mounted cable strain relief for a reliable mic connection while offering simple installation and replacement. Wall mount design – The Zip4 installs seamlessly into a standard 2 Gang US wall box or rework bracket. The Zip4 is also available in a 3-gang form factor (Zip4-3G) with optional accessories for deskmounting and use with a gooseneck microphone. Q-SYS Integration – Integrates directly with Q-SYS PA Router running on a QSC Core series DSP with a dedicated Zip4 control plugin for Q-SYS Designer. Learn more about the Zip 4 at atterotech.com.